Struggling to find the words to speak out and share your story can take time. But when the story is shared, it can be something special. And Antonia Lassar has created something special with Post Traumatic Super Delightful. Post Traumatic Super Delightful, or PTSD for short, is a solo show that talks about sexual assault, finding laughter in the healing process. 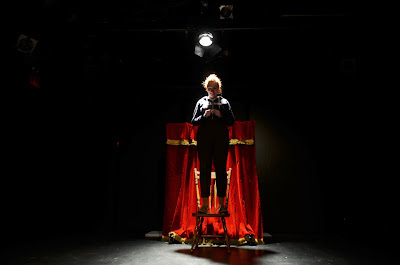 With a mix of storytelling and clowning, writer and performer Antonia Lassar has found a brilliant way to share an important topic. Lassar has created a piece that threads the perspectives of survivors, perpetrators, and the public view that offers a unique viewpoint of the sexual assault crisis on college campuses. To unload on the heavy material, Lassar has brought in bits of clowning to allow the audience to laugh and heal as one. Lassar has a knack for performance. She gets into character and brings that character to life. She gives voice to a very important topic. The only thing that could use improvement is the cohesiveness between the monologue piece and the clown piece. While they both confronted the same important topic, they didn’t seem to inform one another and unite on a theatrical front. From a structural standpoint, the clowning felt a bit too much as a transition rather than a purpose. Director Angela Dumlao did her best to tie the two worlds together. Dumlao brought a great vision to Lassar’s work. Dumlao guided Lassar through the trio of characters she created, helping her transform seamlessly from character to character without the aid of additional costume or prop. The physicality that Lassar provided helped you see just who these people are. Even though the stage was large, Lassar and scenic designer Sam Garcia filled it. Using a clothing rack with an iconic red curtain was a perfect backdrop for the theatrical nature of the clowning. Lassar and Dumlao used the mobility to their advantage. Post Traumatic Super Delightful takes an important topic and allows conversations to be had. Antonia Lassar is a powerhouse artist that makes her voice heard in all the right ways. Put Lassar and PTSD on your radar as the piece continues to develop and grow.